Image by Everett Historical at Shutterstock. 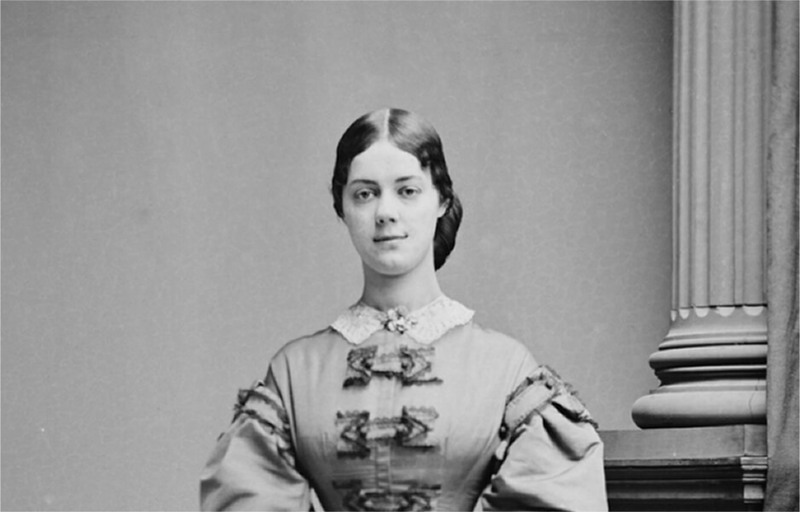 Kate Chase Sprague (1840-1899), daughter of the widowed Salmon Chase, acted as his hostess and supported his presidential ambitions throughout the 1860's. The ladies of the press, by inclination and profession given to skepticism, had appeared at the luncheon anticipating a ghastly masquerade. There had been abundant rumors, which the ladies had been obliged to report in accordance with their duty to their readers, that Kate Chase Sprague was now a Miss Havisham, roaming as a spectre in a cobwebbed and abandoned mansion. Yet these great expectations were confounded once the carriages pulled into the drive. Edgewood had been polished, scrubbed, and manicured such that it nearly gleamed in the spring sunshine. The liveryman, a Yankee named Tom, saw to the horses while white-gloved and ebon-skinned servants escorted the ladies to an anteroom where, perched upon the divans, they eyed critically the decoration of the chamber and determined to their satisfaction that the paneling was gilded in French gold and not German, testament to the good taste of their hostess. After seven guests had arrived, a bell rang delicately, and a footman attired all in white materialized in the chamber. The footman led them into a dining room whose dominant feature was a grand Gobelin tapestry, depicting a scene of medieval France. In the center of the room was a table set for eight, with a heavy white linen cloth and a bouquet of spring flowers, immaculately arranged. The curtains were drawn back, and the golden rays of that radiant orb suffused the scene with warmth and beauty. At the head of the table stood their hostess. The footman gestured toward the seat of honor, at Kate’s right, and the eldest of the feminine correspondents, Miss Emily Edison Briggs, that doyenne of the scribblers known to her readers by her nom de plume “Olivia,” arched her eyebrow in grudging respect, and took her seat. The other ladies, society columnists to papers in Boston, New York, Philadelphia, Chicago, Atlanta, and New Orleans, were seated in accordance with their station. The reporters glanced at one another, for it was plain that Kate had in fact been occupied with other matters, some of extravagant interest. Discretion being the soul of reportage, however, none of the women volunteered this observation. “I can only imagine the effort that you have devoted to your home,” said the New York correspondent, devoted to the rude arts of appraisal, for such is the demand among the readers in that metropolis. “Your home certainly seems simpler than last I was here,” insinuated Miss Briggs. “The tapestry is magnificent,” ventured the correspondent to the Chicago papers. “That tapestry once observed Marie Antoinette at table,” Kate replied. She nodded to a black manservant, specially arranged by Senator Conkling on loan from Wormley’s, who strode to a doorway in the rear of the luncheon chamber, lifted his finger, and a black maid in gleaming white processed to the table with a golden bowl. “Our first course is naturally a consommé,” Kate explained. A golden ladle, in the adroit hands of the manservant, delivered the beef broth into exquisite bowls placed before each of the ladies. Another maid materialized at the opposite side of the table with crackers and Havenner’s cream. An abundance of careful, soundless, sipping filled the next few minutes. “I must say that while your home is decorated most beautifully in the French style, I confess that I do not recognize the work of French artisans in these bowls,” remarked the New Orleans correspondent. “They are from Persia,” Kate said, inspiring a round of knowing acknowledgment from her guests. There was polite tittering, and bobbing of chignons, at this remark, and a tight smile from Kate. The other ladies nodded, for Kate had seemingly exiled herself from polite society to avoid discussing the scandalous events of the summer. Kate had suffered the cloud of indecency only once that season, in January, when the gossip columns authored by much of the ladies present disclosed that she had hosted Senator Conkling and his wife at a dinner. Mrs. Conkling had reportedly been most unpleasantly stoic in accepting her husband’s philandering propensities, in keeping with the spirit of the age. Kate absorbed Miss Briggs’s volley with equanimity, but her competitive fires were lit. The knife was well turned. Miss Briggs’s residence was a paltry shelter compared to Kate’s mansion at Edgewood, and the happy cries of children did not resonate there. And if good fortune had deserted Kate, at least for the time being, all the unique, costly, and superb trappings of good fortune had not. Miss Briggs fell silent and resolved to renew her assault at a more propitious moment. Seizing her advantage, Kate raised one finger delicately in the air, and the servants removed the empty Persian bowls, to replace them with oyster patties. These comestibles were served upon fine porcelain plates that, each guest observed as they glanced from their own plate to their neighbor’s, were perfectly unique. “Are these more to your liking?” Kate inquired of the New Orleans correspondent, who blushed in response. Every lined, well-plucked eyebrow rose at once. Kate nodded at the black manservant, and he promptly procured another plate so that an inspection might be assayed. Miss Briggs was caught unawares at her oyster patty. Kate smiled tightly, for the assault was well executed. But she had long ago mastered the trick of feigning ignorance at a veiled insult. The correspondent from Atlanta, however, began fanning her face. “Any woman in society would know these plates,” Kate pressed. “Why, here I have been derelict in my manners by monopolizing our hostess!” Miss Briggs declared. “I would not want to deprive any of these ladies of the glory of recognizing these works of art. I am sure you know.” She nudged the New Orleans correspondent. “The same,” Kate beamed, after a flicker of disappointment passed. “Have you pillaged the table of both the Prince of Wales and the Shah of Persia?” inquired the Philadelphia correspondent, with that lack of tactfulness so characteristic of that city and its inhabitants. “How clever!” the Philadelphia correspondent replied, while the lady who supplied the Boston newspapers with news of the capital set down her fork and regarded the plate distastefully, being of simple and unassuming tastes. “Now we shall have to dine with the Prince of Wales, so that we may verify your story,” said the New Orleans correspondent, with a mischievous air. “Not since ’seventy-six,” Kate prevaricated, for her interlude with Senator Conkling in ’seventy-seven, which had so aroused the wrath of her husband, the former Senator Sprague, was not known to the public, as far as she knew. Here the gathered ladies of the press nearly gagged upon their oysters. Kate was but ten years younger than Miss Briggs, but the harsh jibe at her mild seniority, coupled with the suggestion that Briggs was unsympathetic to Gallic sorrow, was an unmistakable escalation in the jousting between the two women. Miss Briggs carefully considered her rejoinder. The attendants laid the platters of lamb upon the table, but the eyes of women all lit upon Kate, whose face fell, briefly yet unmistakably, for while her father the Chief Justice had wished for her every good thing, and she had been the object of the fondest efforts of his devotion, there was one blessing that he had not bestowed upon her. This story is based largely from the contemporaneous report of the luncheon by Emily Edson Briggs, “Kate Chase Sprague: A Dinner with the Queen of American Aristocracy, Washington, April 15, 1880,” in The Olivia Letters: Being Some History of Washington City for Forty Years as Told by the Letters of a Newspaper Correspondent (Neale Pub. Co. 1906). Although the details of the food and furnishings are drawn from Briggs, the tensions between the women are my speculation, informed by Kate’s position in society at the time. Peg Lamphier, for example, describes the luncheon as “an immense show of false bravado,” in Kate Chase and William Sprague: Politics and Gender in a Civil War Marriage (U. Nebraska 2003). Small portions of the dialogue are allusions to literature from the era: Kate’s comment that “I think I know my Europe” comes from Henry James, Portrait of a Lady (1880-81); Briggs’s statement that “the Continent is so common, you can’t run over there any more” comes from William Dean Howells, A Chance Acquaintance (1873); Kate echoes Henry Adams’ assertion that Washington D.C. in the 1870s had “no monde, no demi-monde,” The Education of Henry Adams (1907); and Briggs recalls the maxim of Oliver Wendell Holmes (senior, not the Justice): “Sin has many tools, but a lie is the handle that fits them all,” in The Autocrat of the Breakfast-Table (1858).